Fiat to Rescue Chrysler, Obama "Hopeful"
The Fiat partnership is the last piece of a huge restructuring plan needed for Chrysler to continue operations as it approaches Thursday's government deadline to cut labor costs, slash debt and take on a partner. DETROIT — President Barack Obama said he is "very hopeful" that deals can be worked out to keep Chrysler a viable automaker, as negotiations with debtholders continued late Wednesday and Italian automaker Fiat Group SpA was poised to sign on as a Chrysler partner. Obama said at an evening news conference that he is more hopeful than he was a month ago that Chrysler LLC will stay in business, but he declined to comment on details. Also Wednesday, a person briefed on the high-stakes Chrysler negotiations said the company will not be sold off in pieces but could still wind up under Chapter 11 bankruptcy protection. A restructuring out of bankruptcy also is possible, depending on whether a deal can be reached to reduce Chrysler's $6.9 billion in secured debt. The company's fate appeared to be in the hands of about 40 hedge funds that hold about 30 percent of its debt. Although four banks that hold 70 percent of the debt have agreed to erase it for $2 billion, the hedge funds were holding out for a better deal. Obama, though, pointed to movement on the debt and concessions from labor unions to say that he was optimistic. "All of that promises the possibility that you can get a Fiat-Chrysler merger and that you have an ongoing concern," he said. "The details have not yet been finalized, so I don't know to jump the gun. But I am feeling more optimistic than I was about the possibilities of that getting done." Obama's administration sweetened its offer to the debtholders Wednesday, adding $250 million with a 6 p.m. deadline. But the debtholders were discussing counteroffers, said U.S. Rep. Gary Peters, D-Mich., whose district includes Chrysler's Auburn Hills headquarters. "You've got high stakes negotiations going on right here at the very last hours," he said. "It's frustrating that these hedge funds continue to push for every last nickel," Peters said. "Tens of thousands of families' lives are at stake here." Three people briefed on the talks said the debt issue will be settled either in or out of bankruptcy, and the Fiat partnership would be signed by Thursday as the last piece of a huge restructuring plan needed for Chrysler to continue operations. The company, which has borrowed $4 billion from the federal government and needs billions more, faces a Thursday deadline to cut labor costs, slash debt and take on a partner if it wants more aid. If the government can't reach an agreement with all of Chrysler's debtholders, the company would file for Chapter 11 bankruptcy and enter a short period of restructuring, the people said. If there is an agreement, the company would be able to restructure out of court. In both cases, the government would finance the restructuring, the people said. "Chrysler will survive and avoid liquidation. Whether that happens in or out of bankruptcy remains uncertain at this point," said one of the people. The smaller lenders would have little power to stop the debt from being restructured in bankruptcy court, since the lenders holding the majority of the debt are on board with the plan, the people said. All of the people spoke on condition of anonymity because the partnership agreement had not been announced. Obama may hold an event at the White House on Thursday should a deal be ready to announce, but nothing has been finalized. 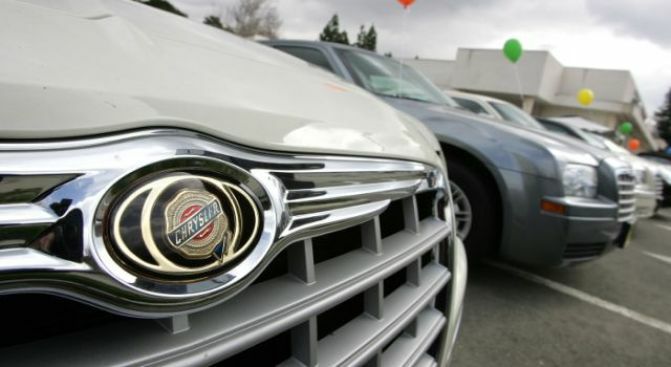 Fiat spokesman Gualberto Ranieri declined to comment on the situation. Chrysler spokesman Todd Goyer said there's so much speculation "that it would be inappropriate for us to comment prior to any official announcement." The government in March rejected Chrysler's restructuring plan and gave it 30 days to make another effort, including a tie-up with Fiat. On Sunday, the Canadian Auto Workers ratified concessions to the automaker, and the United Auto Workers in the U.S. reached a tentative cost-cutting deal that members will finish voting on by Wednesday night. Workers at two Chrysler factories in suburban Detroit overwhelmingly approved the concessions. UAW members at parts stamping plants in Warren and Sterling Heights, Mich., each voted 81 percent in favor of the deal, union officials said. Chrysler CEO Robert Nardelli said Wednesday in an e-mail to employees that the automaker was making progress toward meeting the government's restructuring requirements. He pointed to the deal with debt holders and the UAW deal. "I'm encouraged by this progress and I want you to know I deeply appreciate the sacrifices made by so many constituents to help us reach the restructuring targets established by the government," Nardelli wrote. The Fiat partnership means Nardelli could be out of a job. In an April e-mail to employees, he said that if the deal is finalized, Chrysler would be run by a new board appointed by the government and Fiat. The new board, Nardelli wrote, would pick a CEO "with Fiat's concurrence." Sergio Marchionne, CEO of the Italian automaker, told reporters earlier this month that he could run Chrysler. Obama said Wednesday that Fiat's management "has actually done a good job transforming their industry." The government clearly was trying to pressure the hedge funds as Chrysler's deadline approached. Its sweetened offer would go back to $2 billion if not approved by all the lenders. Michigan Gov. Jennifer Granholm, speaking in Lansing at a news conference about the swine flu, urged them to consider Chrysler's 54,000 employees. "The future of Chrysler is in the hands of some of these hedge funds that want to hold out for a greater profit," she said. "So on behalf of Michigan, on behalf of the thousands of people who will be affected if this company is forced into bankruptcy, I am publicly asking these hedge funds to not be greedy but to do what the banks have done and what everyone else around the table has done — take the concessions," she said.